DOLAKHA, March 23: Minister for Energy, Water Resources and Irrigation, Barshaman Pun observed the 456-Megawatt capacity Upper Tamakoshi Hydropower Project, a national pride project, today. In course of the inspection, he said he has come to the project site along with the high officials of the Nepal Electricity Authority and the project for the project's monitoring, observation, resolving the problem and facilitation. The Minister had taken information about the project's progress from the project chief Dinesh Jung Rana and chief executive officer Bigyan Shrestha. 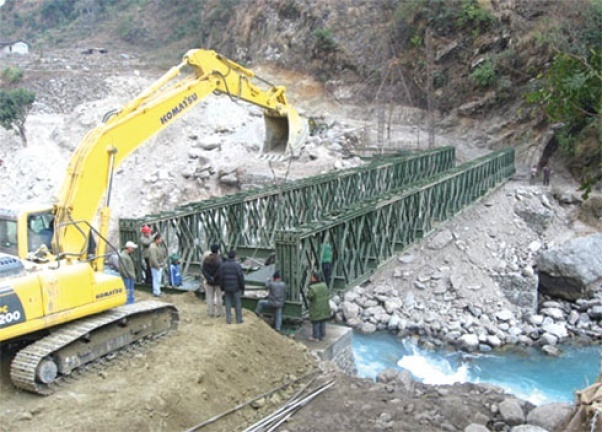 He stressed on the need of completing the Tamakoshi Hydroelectricity Project within the stipulated timeframe. "We have serious concern in this project as it is a very important project. I have focused all my attention to completing the project in time and maintaining its quality of work. I am confident of the project's completion within the stipulated timeframe," he said. "There was some problem some time back due to the vertical shaft. As per our direction, Andritz Hydro of Austria and Indian company Texamo worked collectively for the construction works of two vertical tunnels. Remaining works are going on with a target of completing them by the coming mid-November," he said.